Hours after Egypt's former military chief Abdel-Fattah El-Sisi announced his candidacy for the country's upcoming presidential elections, political forces' reaction varied from support, to objection and indifference. As field marshal, El-Sisi had occupied the highest rank in the military, until he resigned on Wednesday and then appeared later that night on state-run TV to give a 15-minute speech in which he announced his intentions to run for president. The much anticipated bid came as no surprise for the millions of Egyptians who had been pressuring El-Sisi to run for president since the ouster of Islamist president Mohamed Morsi last June, following mass protests against his rule. The 59-year-old former general is widely expected to win the elections, scheduled to kick off 30 March and wrap up by mid-July. Meanwhile, liberal forces that stood against Morsi and the Brotherhood say they're neutral regarding El-Sisi's presidential bid, neither supporting nor rejecting his campaign. 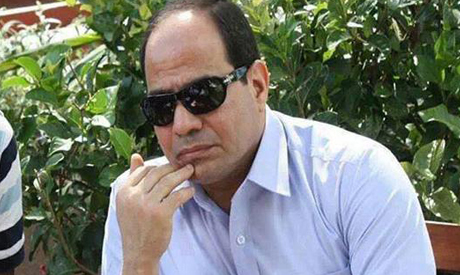 The liberal Constitution Party, formed after the 2011 uprising, said that El-Sisi has the right to run for president "as a civilian after he resigns from his post." The party urged state institutions not to interfere in the elections by supporting El-Sisi in any way, according to a statement released on Wednesday by party spokesman Khaled Dawoud. "We hope he keeps a distance from state institutions during the candidacy period," Dawoud said. The Constitution Party is perhaps most associated with its founder, former vice president and Nobel laureate Mohamed Elbaradei, who resigned from his post with the first post-Morsi interim government in protest against the violent dispersal of a pro-Brotherhood sit-in last August that killed over 600 people. The party has since been taken over by Hala Shukrallah, who made waves earlier this year for being the first woman and Coptic Christian to head a political party in Egypt. While party spokesman Dawoud did not confirm whether or not the Constitution Party would support El-Sisi in the elections, he said the party would "choose a candidate who participated in the revolution, believes in the democratic path and is closest to the principals of social justice and human rights." Another liberal party, the Egyptian Social Democratic Party (ESDP), said that it will judge the elections according to their fairness. "From this day on, we aren't dealing with El-Sisi as the general who stood on 3 July [the date of Morsi's ouster], but as a presidential candidate who has to first present his electoral program before we have any official stance," Ahmed Fawzi, the party's secretary-general, told Ahram Online. Fawzi said the group will be monitoring the political atmosphere to see if it leads to free elections, as well as evaluating the efficiency of the Supreme Electoral Commission (SEC). The ESDP is also concerned with how the state will handle human rights issues, Fawzi said, adding that all political detainees should be released. Either way, Fawzi acknowledged that El-Sisi has an "advantage" in the election in that he appeared on state-run TV in a military uniform to speak about his candidacy and platform. Egypt's oldest liberal party, the Wafd Party, has a clearer stance of approval regarding interim authorities. Abdel-Hamid Imam, leading member of Wafd Party, said told Ahram Online he supports El-Sisi and "wishes to be part of his campaign." "He is the man for the time, he deserves it … he's a patriotic man," Imam said. "He will be a president for all Egyptians, not like Morsi, who was a president only to his group (the Muslim Brotherhood)." Until now, there's only one rival for the former military man: leftist politician Hamdeen Sabbahi, who finished third in 2012's presidential elections. Sabbahi has criticised a newly issued elections law that immunises the decisions of the Presidential Elections Committee (PEC), the judicial body tasked with supervising the polls. Still, Sabbahi confirmed that he will run for president, though. "I welcome El-Sisi's candidacy," Sabbahi said early on Thursday via Twitter. "We look forward to democratic, fair and transparent elections that guarantee the impartiality of the state and the people's right to choose a president with their free will." A spokesperson for Sabbahi's presidential campaign, Masoum Marzouk, called for "equal opportunities" to allow Sabbahi to deliver an address on state-run TV as the El-Sisi did, Al-Ahram's Arabic news website reported. For months now, state media along with most of the country's private outlets have depicted El-Sisi as the only choice, the man who "saved" Egypt from the rule of the Brotherhood, portrayed as a negative force that has tried to destroy Egypt. The largest opposition in the Islamic bloc naturally comes from the Muslim Brotherhood, from which Morsi hailed. The group says it will continue with protests against Egypt's interim authorities and the likely presidency for El-Sisi, who it holds responsible for Morsi's ouster and the state's crackdown on the group's members and top leadership. "The mask has fallen with the announcement of [El-Sisi's] candidacy for the presidency of bloodshed," the National Alliance to Support Legitimacy (NASL), a pro-Brotherhood coalition, said in a statement on Thursday. The NASL called for fresh protests on Friday – a continuation of nearly eight months of demonstrations, which have persisted despite a sharp decrease in the coalition's supporters. Hundreds have been killed in clashes between security forces and Brotherhood loyalists since Morsi's ouster. Islamist students have been at the forefront of the unrest, leading pro-Morsi protests at universities nationwide, with tens killed in clashes with security forces. The only Islamist party to back Egypt's interim authorities and their post-Morsi road map has been the Salafist Nour Party, whose support has remained intact despite not being included in two ministerial cabinets. Nour Party spokesman Nader Bakker told Ahram Online that El-Sisi's speech on Wednesday had been balanced and positive for several reasons, including what Bakker felt was a frank portrayal of the challenges that Egypt faces. "[El-Sisi] saying that he would include all Egyptians without exclusion shows a clear intention to turn a new page," Bakkar said, alluding to a possible reference to the Brotherhood. "This will neutralise many parties that are on the opposition side." The Strong Egypt Party – a moderate Islamic party led by former Brotherhood member and 2012 presidential candidate Abdel-Moneim Abul-Fotouh– objected to El-Sisi's candidacy, which it sees as "a grave danger to the future of Egypt and democracy." "Egypt does not need a saviour, but it needs justice, freedom, dignity, pride and true independence," the party said in a statement Thursday. "This will only be achieved through lifting injustice, holding criminals accountable and providing rights for all citizens without discrimination or segregation." The statement argued that El-Sisi's candidacy might cause the army to be distracted by politics and thus neglect its only duty – maintaining national security by controlling Egypt's borders. The April 6 movement – a youth group that led some of the first protests against longtime autocrat Hosni Mubarak – has voiced concern and objects to El-Sisi's declared campaign. "His candidacy will not be in the benefit of the polarised nation and will not achieve the goals of Egypt's revolution," April 6 spokesman Khaled El-Masry told Al-Ahram's Arabic news website on Thursday. "It will increase divisions and distract us from the goals of stability and development." El-Masry argued that the army's role of protecting the country is more important than ruling it. "We trust that the army did not move [to oust Morsi] so that its leaders could rule," he said. "The electoral process will be futile if state institutions mobilise in support of El-Sisi."